J-Con has been around now a long time! We've been fortunate enough to run it every year with increased success. J-Con 2008 (Lesser known as Chibicon) started the whole thing off! With a small convention made up of 300 people and a handful of traders and artists, we were able to create the beginnings of something special. Held at the Assembly Rooms, Chibicon was a great learning experience for the team and we were able to take the best of it to make the future conventions. Our 2nd year came with a name changed to avoid clashing with a Dutch convention. And suddenly we're looking at 700 people! This time, the day was packed full of events and guests including Helen McCarthy & Akemi Solloway as well as a full array of traders and artists. We also dipped into traditional Japanese culture with a tea ceremony and calligraphy. 2009 also began the tradition of getting our Ninja to do ridiculous things in the name of fun! Good times! Included a music performance from J-Rock band F Size Free. J-Con 2010 was to date our largest convention with over 1000 people attending. A great convention featuring Sonia Leong, A Japanese Tea Ceremony, Gothika and numerous other J-related figures. By this point our convention line up was more or less established, with all the great games, competitions, panels and events that make J-Con unlike any other convention ^_^. A new year, a new venue, JC11 proved to be the most enjoyable to date, with an atmosphere unlike any other. Featuring an array of bands and a brilliant J-Rock DJ, this time, we changed the formula, merging traders into the main hall with the events. It worked, and 700 people manically enjoyed themselves and J-Con kept it's crown as the East Midland's best J-Convention ^_^. Our 5 year anniversary convention...Our largest ever attendance (well over 1000 people) swarmed our convention center. Guests included voice actor MasokoX, artist Sonia Leong, Traditional Japanese musicians Ichikawa and Mochida and live music from Zonic, Area 11 and our resident DJ. Everything from D.D.R. to Text-A-Ninja was on hand to make J-Con 2012 a truly brilliant event! 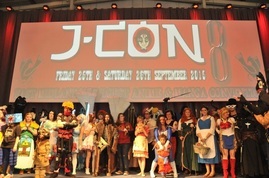 The 2013 event saw 1000 people pile into J-Con over 2 days. Friday night featured Nerdcore artists B-Type and a return of Zonic from the previous year as well as an extended performance from our very own Johnny Reaper. Fast Track ticket holders were treated to a Buffet and there was also anime screenings and panels. Saturday featured the new additions of the arcade machines as well as D.D.R. and Mario Kart. We also welcomed several new guests including Parle Productions and Steampunk authors Major Jack Union and Emily Ladybird. 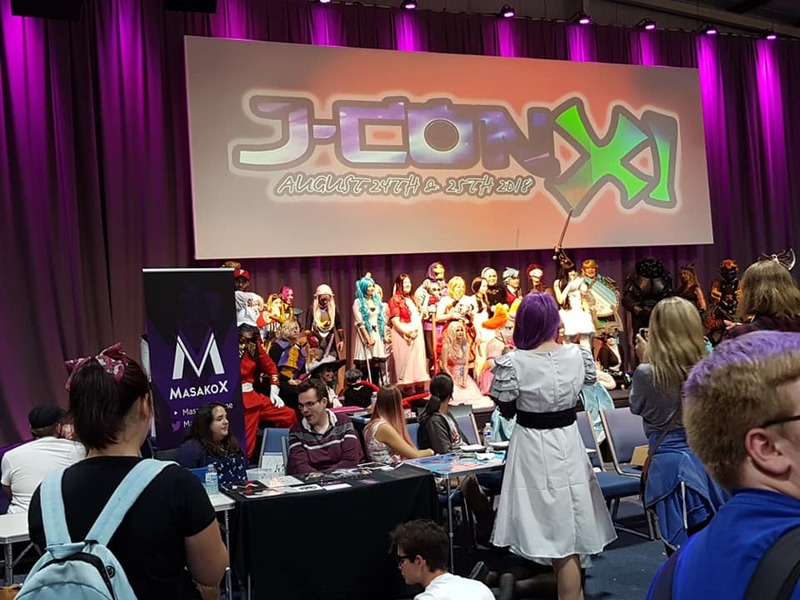 J-Con VII proved to be as popular as ever with over 1000 people attending over the 2 days. Mixing up the formula a bit, we went for a Cinema night over live music for the Friday with the usual Saturday layout. The smell of popcorn that greeted people was most welcoming, and we were treated to a special full version of Kampfer Abridged, one of returning guest, MasakoX's creations. 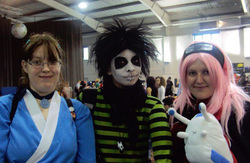 Other guests included cosplay experts Tab Kimpton, Smallfry Productions & Iron Manda. J-Con VII was also famous for bringing us national attention via The Sun thanks to their article on the police being called out by concerned residents over prop guns being seen in the local area! J-Con VII has been far and wide considered the best J-Con yet. Over 1500 people piled in over 2 days. Guests included the impossibly amazing Savlonic, B-Type, Kelsey Ellison, Major Jack Union, MasakoX and a strong sprinkling of Stormtroopers and of course Darth Vader. Highlights included the excellent cosplay contest, no one understanding the rules to Eliminator, being on BBC news, Kelsey Ellison being introduced as Kelsey Grammar and catching only the 2nd gig by Savlonic ever! Truly fantastic! J-Con 9 Took place on September 30th & October 1st 2016. Guests this year included our first international guest, Italian Cosplayer Giada Robin. Savlonic returned for their second year. We also welcomed Welsh band The Happy Funtime Retro Gaming Band. Other guests included Kelsey Ellison, Cosplayer Hollita and Eile Monty. J-Con 9 also launched the idea of Fan Panels - allowing ticket paying attendees the chance to showcase their own knowledge and expertise about Anime and J-Culture. Savlonic returned for their 3rd consecutive year, supported by fellow returners B-type & THFGB. Kelsey Ellison, Eile Monty and MasakoX all returned as we also added Patriarch of the internet, Mr. Weebl and animator Paul Otaking to our line up. J-Con XI was a step away from the standard J-Con experience. A difficult wedding season had meant we lost our standard September slot and had to move to the end of August. J-Con in the Sun turned out to be a very chilled back event. We brought back a lot of the seasoned guests, with Eile Monty, B-type, MasakoX, Iron Manda & Smallfry Productions all appearing. We also introduced newcomers to J-Con in form of Electro/Chiptuner Nyokee & All-round star performer Bentley Jones. We also said goodbye to the terrible food hatch and introduced a whole range of good quality food.